From inland or ‘dry’ ports in Central Asia, to ports associated with infrastructure and logistics in the Middle East, Europe, South and Southeast Asia and Africa, Chinese companies are busy making acquisitions to consolidate maritime cooperation under the Belt and Road Initiative. In some cases, they are not only buying or leasing these assets but are establishing special economic zones to boost investment and trade. This year, China has already invested more than $20 billion in container ports and terminals around the world, almost double the amount spent in 2016. In the last two years, Chinese State-owned companies have secured control of global container ports and terminals including Zeebrugge in Belgium, Valencia in Spain, Piraeus in Greece, Darwin in Australia, Hambantota in Sri Lanka and Participacoes in Brazil. 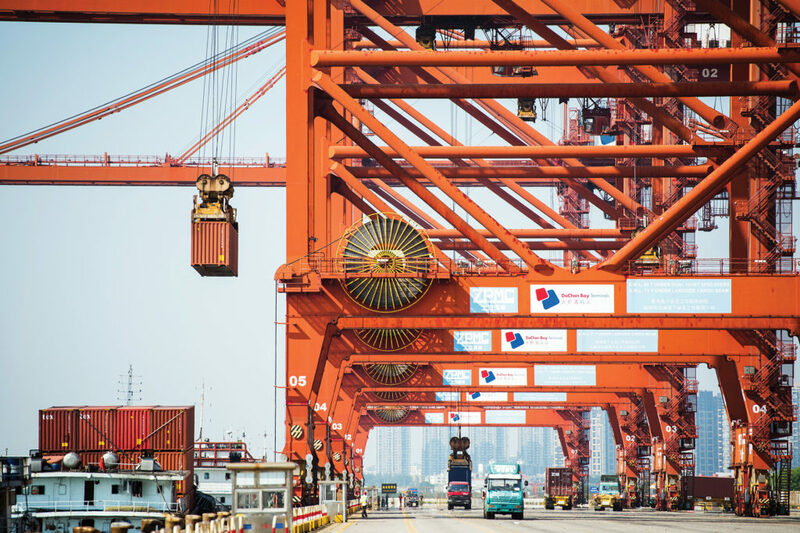 Roger Montgomery, founder and chief investment officer of the Sydney-based Montgomery Fund, said that more than half of all port or container terminal acquisitions around the world this year have been made by Chinese companies. A recent report in the Financial Times said Chinese entities have invested in ports in 68 countries this year alone. And with the Belt and Road incorporated into the Constitution of the Communist Party of China at its 19th National Congress in October, analysts now expect to see an acceleration in projects. President Xi Jinping first proposed the Belt and Road Initiative in 2013, with the aim of revitalizing transport and trade links along the ancient Silk Road routes and boosting China’s role on the international stage. The plan now comprises six economic land corridors (road and rail) and three blue (maritime) economic passages. Speaking from London, Tillman told China Daily Asia Weekly that a fourth corridor via the Arctic Ocean is being looked at, “but as yet no action has been taken on it”. The Arctic has become a new area for the development of the Belt and Road as the Silk Road on Ice becomes feasible, according to a report by Grisons Peak. “China will work with countries bordering the Arctic Ocean to build infrastructures, such as harbors, roads, bridges and communications facilities in order to improve connectivity and commercial feasibility of the Arctic route,” the report said. At a meeting between Xi and Russian Prime Minister Dmitry Medvedev on Nov 1, both agreed that China and Russia should jointly develop and cooperate on the use of the North Polar sea route and build a Silk Road on Ice. China is also talking with the governments of Norway, Iceland, Finland and Denmark, said Tillman. He said a maritime route from China to Europe via the Arctic Ocean would cut several days off the traditional southern sea routes. “I don’t think too many people fully understand the significance of the Belt and Road Initiative and what it will bring to countries and to the world. Nothing like this has ever been done,” he said. The importance China now places on the initiative was highlighted by Xi in his report to the National Congress of the CPC on Oct 18 when he said: “China will actively promote international cooperation through the Belt and Road Initiative. In June, COSCO Shipping Holdings, China’s largest shipping group, bought a 51 percent stake in Spanish container terminal operator Noatum Port Holdings for $228 million. The last decade has seen the emergence of State-owned companies gaining control over large strategically located world ports, a development made official by government policy through the Belt and Road, said Olaf Merk, the administrator for ports and shipping with the International Transport Forum of the Organisation for Economic Co-operation and Development. “Ports have proved powerful tools in stimulating regional and national economies,” said Merk. Merk said Shenzhen, in South China’s Guangdong province, is an example of a port that helped drive China’s export boom of the 1980s. He said investment in foreign ports is one way to “internationalize” a national economy and an entire domestic maritime cluster in areas like port engineering, design, equipment, operations, construction, dredging, free trade zones, hinterland transport services, freight train infrastructure and pipelines. On June 20, China’s National Development and Reform Commission and the State Oceanic Administration released a document, titled Vision for Maritime Cooperation under the Belt and Road Initiative. Under the proposal, China plans for three ocean-based “blue economic passages” connecting Asia with Africa, Oceania and beyond. All three passages are now “priority maritime cooperation tasks”, according to Xinhua News Agency. 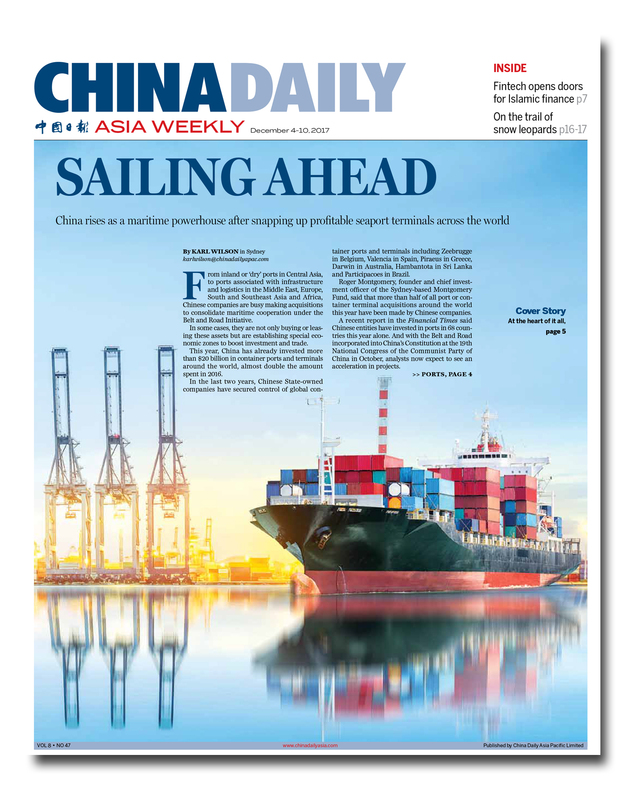 “The fact China has now announced all three of its blue economic passages, it is not surprising to see this significant level of increased investment in ports and shipping,” Tillman of Grisons Peak said. He cited one of this year’s major Chinese deals as China Merchants Port (CMPort) Holdings’ acquisition of a 90 percent stake in TCP Participacoes, Brazil’s most profitable port terminal, for $924 million. The deal, which took place in September, is expected to help CMPort develop its logistics network, increase exports and imports, build more industrial zones and set up potential residential projects. “Brazil, as the largest economy in Latin America, has huge market potential coupled with abundant resources and reserves,” CMPort said in a statement at the time. In June, COSCO Shipping Holdings, China’s largest shipping group, bought a 51 percent stake in Spanish container terminal operator Noatum Port Holdings for $228 million, extending its ports and terminals business networks across the Mediterranean and European areas. COSCO bought the stake from TPIH Iberia SLU, a company incorporated in Spain, in a deal to be funded by internal resources and bank borrowings. TPIH will hold 49 percent of Noatum Port, which operates container terminals in the ports of Valencia and Bilbao. In July, CMPort acquired an 85 percent stake in the Sri Lankan port of Hambantota for $974 million. The government has given assurances that China will run only commercial operations from the port which straddles the world’s busiest east-west shipping route between Asia and Europe. The inclusion of the Belt and Road in the CPC Constitution surprised many, but it underscored the importance China has placed on foreign policy. Under the proposal, CMPort will have a 99-year lease on the port and more than 6,000 hectares nearby for an industrial zone. CMPort will invest $1.12 billion, which includes the $974 million paid directly to the Sri Lankan Port Authority, into the port and related shipping businesses. In May, two Chinese companies signed a contract with Kazakhstan’s national railway company to buy 49 percent of an inland port near the China-Kazakhstan border. China COSCO Shipping and Jiangsu Lianyungang Port Co will each hold 24.5 percent of the port in the Khorgos-East Gate special economic zone, according to a statement from China COSCO Shipping. The inclusion of the Belt and Road in the CPC Constitution surprised many observers attending the CPC National Congress, but it underscored the importance China has placed on foreign policy. “Everyone knows that the Belt and Road is very important to Xi, it has his personal stamp and authority,” said Peter Cai, a non-resident fellow at the Sydney-based think tank Lowy Institute. “But to have major policy, especially an external engagement policy, to be written into a Party Constitution, at least in recent memory, it is something quite significant,” he said. Gabriel Wong, head of China Corporate Finance and One Belt One Road Leader with consulting firm PwC in Hong Kong, said: “Ports are one of the key components of Belt and Road connectivity. “Along the various corridors, countries will be linked to China via road, rail and sea. Not only will it open the economies of many countries to the outside world, it will also grow their domestic economies as trade increases,” he told China Daily Asia Weekly. Wong said he expected to see further acquisitions and investments targeting ports, transport and freight-forwarding companies in a number of Southeast Asian countries over the next few years, especially in Myanmar, Malaysia, Singapore and Indonesia. Until recently, Khorgos was considered the middle of nowhere, straddling the border between China and Kazakhstan. But today the Khorgos Gateway is the world’s biggest dry port, connecting China to Central Asia and Europe. It is a key component of the Belt and Road Initiative, the China-led plan for a trade and infrastructure network that revives the ancient Silk Road routes. The Khorgos Gateway sits within the Khorgos Eastern Gate Special Economic Zone, a 600-hectare development area strategically positioned in Kazakhstan, on the border with China. According to Grisons Peak, a London-based merchant bank, it is the “heart of an emerging network of trans-Eurasian rail lines which directly connects cities in China with cities in Europe”. Central Asian countries, such as Kazakhstan, are often associated with the historical overland Silk Road trade routes. In May, China COSCO Shipping Corporation, one of the world’s largest shipping companies, and the Port of Lianyungang in East China’s Jiangsu province acquired a 49 percent stake in the Khorgos Gateway. At that time, after just one year of operation, Khorgos was already handling more than 20 percent of its 2020 goal of 500,000 twenty-foot equivalent units per year, according to Forbes. Grisons Peak said: “With its new partners, cargo volumes are expected to increase significantly. “The Port of Lianyungang is one of the larger seaports in the world, moving 200 million tons of cargo and 5 million containers per year,” the merchant bank said in a report released on Nov 22. Also, it is one of the starting points of the Belt and Road’s central overland corridor between China and Europe. “The partnership involving … China’s shipping industry with the Kazakh dry port shows the increasing importance of Kazakhstan within the (Belt and Road Initiative),” the bank said. Railway cargo from Khorgos can reach Lianyungang in five days and Europe in about 10 days. 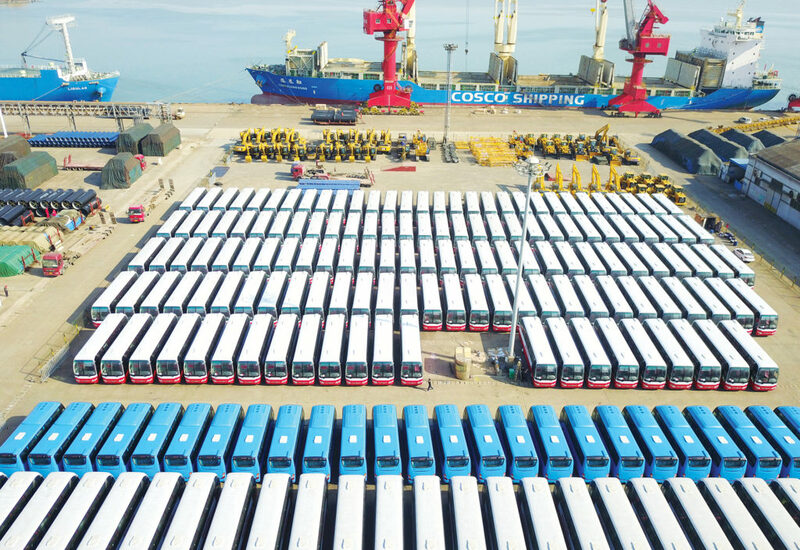 Xu Lirong, chairman of China COSCO Shipping, said in May that the dry port is the company’s first overseas railway investment project since the corporation was established. He said the company aims to build it into an important trade passageway and a model Belt and Road project for China and Kazakhstan. Because of the differences in rail gauges between China and the old Soviet Union, as freight trains converge on Khorgos, massive gantry cranes move up and down the rail tracks to lift and transfer containers to trains heading in the opposite direction. “To the credit of Khorgos’ detractors, the place truly is unbelievable,” Forbes magazine said earlier this year. “It’s a colossal development zone that contains a conurbation of national-level projects that are rising up on both sides of the China/Kazakhstan border — the proverbial middle of nowhere. “The Khorgos area is nothing if not remote. It is situated a tick from the Eurasian Pole of Inaccessibility, the farthest point on Earth from an ocean. Radiating out from all sides of this place is little more than sand dunes and mountains,” Forbes said. Ten years ago there was nothing in Khorgos, but today it has become a Kazakhstan hub for handling trans-Eurasian trains. These trains travel more than 9,000 kilometers from cities like Southwest China’s Chongqing and Chengdu, and Yiwu in East China’s Zhejiang province, to cities in Europe like Barking, on the outskirts of London, Duisburg in Germany, and Lodz in Poland. There are currently 39 such China-Europe routes in operation — an emerging network that is revolutionizing the rail industry across Eurasia. Oman’s economy has been particularly hard hit by low oil prices. Hans Hendrischke, professor of Chinese business and management at the University of Sydney Business School, said the dry port at Khorgos has become vital to the inland Belt and Road. “We should not underestimate its importance to the Belt and Road as it opens up a vital corridor between the eastern seaboard of China, Central Asia and Europe,” he told China Daily Asia Weekly. He said the different rail gauges between China and Europe are a problem which adds to cost, but the time factor would go some way toward compensating this expense. Hendrischke said Khorgos is a good example of how development can take place along the inland route, “opening up new avenues of trade with China, Central Asia and Europe”. Khorgos is just one of the many projects along the Belt and Road. In Oman, construction has begun on a multibillion-dollar investment that will transform Duqm, 550 km south of Muscat, into a major special economic zone and industrial center, providing jobs and helping to transition the economy away from its main exports of oil and gas. Duqm, which sits on the Arabian Sea, is seen as a potential operating base for Chinese businesses near export markets which China wants to develop in the Gulf, the Indian subcontinent and East Africa, said a report by Reuters on Sept 5. The result could be a bonanza for Duqm, according to Ali Shah, chief executive of Oman Wanfang, a Chinese consortium. Eventually, Chinese firms aim to invest up to $10.7 billion there, he told Reuters. “Duqm isn’t like Jeddah or like Dubai. It’s still new, it needs time to develop. But we at Wanfang are thinking the future for Duqm will be better than those cities inside the Gulf,” the report quoted Ali Shah as saying. Speaking to investors, Yahya Jabri, chairman of a China-Oman industrial park, said: “As a World Trade Organization member, we have rolled out a string of favorable policies for investment. “Besides oil, we enjoy an advantageous location, a good deep-water port, and complete ship-repairing facility,” Jabri said at the China-Arab States Expo in Yinchuan, capital of Northwest China’s Ningxia Hui autonomous region, on Sept 8. Besides traditional projects in energy and resources, Chinese and Arab businesses have started to explore more sectors. He said goods transported via Duqm will reach 22 million metric tons in the next decade and predicted the country will become the gateway to North Africa. “Oman welcomes more Chinese entrepreneurs to set up joint ventures or solely foreign-owned businesses,” he said. Although still under construction, Jabri’s industrial zone is expected to be an exemplary project in China-Arab industrial cooperation, the Xinhua News Agency said in September. With the foundation stone laid in April, it is designed to develop into a logistics center, commercial harbor and tourist site for the Arabian Sea, covering an area of nearly 1,200 hectares. “With huge market potential and unique natural resources, Arab economies are complementary to China,” Chen Zhou, vice-chairman of the China Council for the Promotion of International Trade, told Xinhua. Besides traditional projects in energy and resources, Chinese and Arab businesses have started to explore more sectors, such as chemical industry, telecommunications and manufacturing, said Li Shaotong, an official at the Ministry of Commerce.